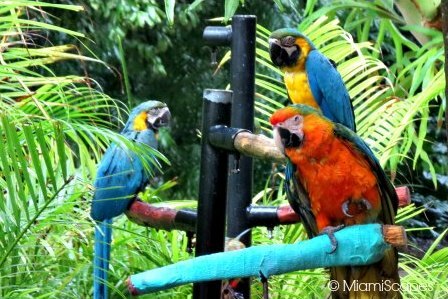 We have known Jungle Island from the early days when it was "Parrot Jungle" in South Miami. 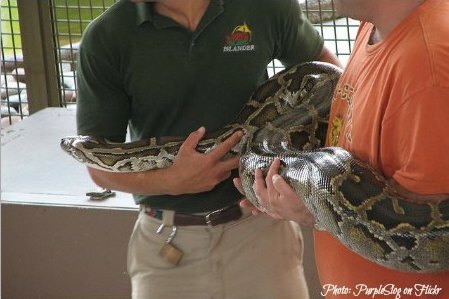 In the early days it was known for the gigantic variety of colorful birds, the parrots, macaws, flamingos... now, Jungle Island has branched out to encompass a wide collection of animals beyond the feathered kind and an array of unique encounters which are one of the main attractions of the park. Its new location in Watson Island, just minutes from downtown Miami is a beautiful tropical setting with killer views of the bay and the Miami skyline. The park is small and compact, so you can cover most of it in a couple of hours, but like mentioned before, there are a lot of activities, shows, and animal encounters, and now after the latest transformation since the aftermath of hurricane Irma, new attractions have been added or are coming soon, including a private beach club, a rope course, zip lines, an indoor trampoline park, an outdoor skydiving wind tunnel, a new children's playground, and a beach restaurant. Yes, it has changed, but one thing remains constant if you're wondering... you can still take pictures with the parrots!!! 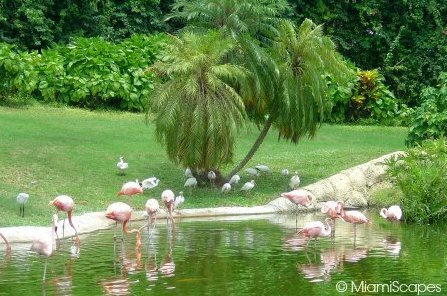 And along the paths throughout the park you are likely to find free-roaming cranes, iguanas, turtles, and lots of parrots and macaws perched on trees or stations all over, they are cageless and you can feed them and really get up close. Also throughout the exhibits, watch for keeper talks and presentations where you can learn about the animals, their habitats and their daily routines. 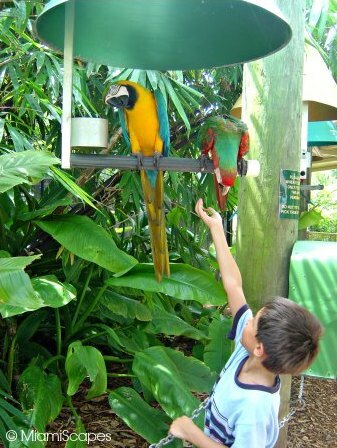 One thing to keep in mind when you visit Jungle Island is that while many of the activities and exhibits are free with admission, many activities carry an extra fee, and in some cases as in the premium interaction and encounters, reservations are necessary. First thing we do upon arriving at the park is check out the day's schedule for show times and plan the day accordingly. There are three shows with several acts throughout the day. Shows are free with admission to the park. The exhibits are scattered throughout the park in no logical arrangement so just make sure you get a map and find everything that interests you. Some of the big cats are no longer at the park. There are exhibits for exotic birds, penguins, kangaroos, lemurs, baboons... and also a Petting Zoo, and many offer interactive activities where you get to play with and feed the animals. This is where Jungle Island really excels, from cuddling with Lemurs and Kangaroos, feeding llamas and birds, holding snakes and alligators... even bottle feeding a tiger cub, the range of their interactive activities and encounters is really superb. 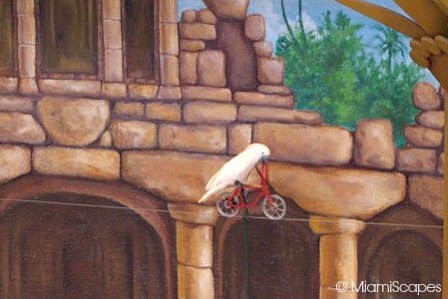 As you can guess, many of these activities come with an extra fee, ranging from a couple of dollars to buy feed for the animals, to several hundred dollars for some of the more exclusive VIP experiences, the backstage tour of Jungle Island so to speak. Playing with the Lemurs has been a favorite of ours. 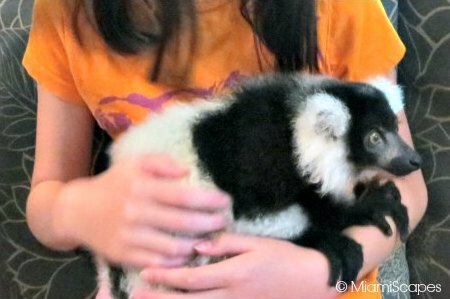 My nieces really enjoyed cuddling with the fluffy critters, you have them climbing all over you, sitting in your lap, your shoulders, your head... You need to make a reservation for the Lemurs and for some of the other encounters. How Much and Where to find discount tickets or coupons to Jungle Island Miami? You can get discount tickets via Klook.com. General admission including tax: $53.20 $49 Adults, $40.14 $37 Children. More info and booking Jungle Island discount tickets. If you have the Go Miami Card, entrance to Jungle Island is FREE. Check the Jungle Island site for online discounts. Where? : 1111 Parrot Jungle Trail Miami, Florida 33132. Off of I-395 between Downtown Miami and South Beach. Directions and more info. Or call (305) 400-7000.